TC-7220 Stereo Amplifier and Speaker selector is a well designed 2 way audio switch control center provides you the possibility to enjoy the convenience and flexibility of listening at different speakers and amplifiers combination in your system. Select between or control two amplifiers or speakers in 2 different rooms or locations. Connect a Bi-wire enabled speaker to the speaker selector and control it from one of two amplifiers. Connect a subwoofer to one pair of speaker terminals and a full range speaker to the other pair of speaker terminals. The combined screw and banana plug terminals on the switch box allow secure and easy access for cables. This unit features high quality, precision crafted, quality speaker connectors for maximum reliability and durability. 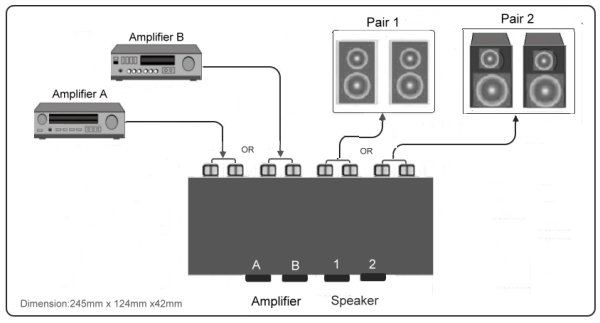 Listen to amplifier A or B through one pair of speakers. Listen to speakers pair 1 or 2 from one of the 2 amplifier. Passive design, no power required. Completely separate left and right channel for safe operation with all type of amplifiers. Heavy duty binding post for easy and safe wiring. Supports amplifiers up to 200 watts music power.